Three years earlier, he and his partner moved from a condo in center city to a compact 1955 ranch they saw advertised one Sunday. “We hadn’t discussed buying a house, but within four hours we were under contract,” Wakefield says. Stone balls accent the sun-dappled moss lawn in early fall, and at driveway level you see the new anodized aluminum Avanti garage door from Clopay. 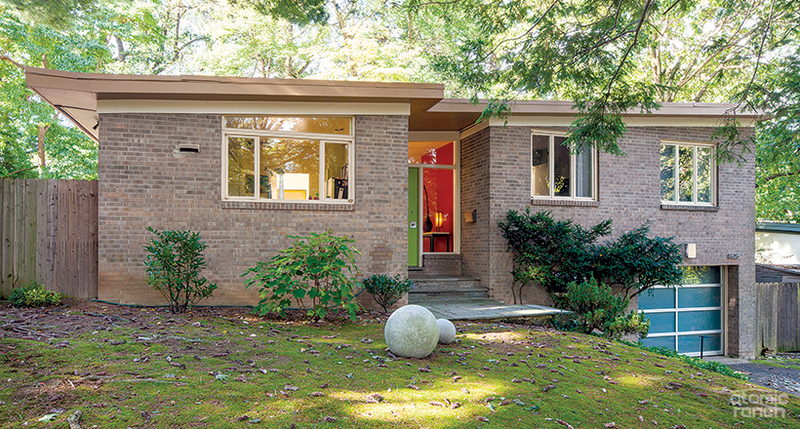 Wakefield kept most of the features in his midcentury home — including one normally off-putting paint color. Find out what loud color remained, as well as what Wakefield thinks is okay to update, in part two!